WGN Radio: After Hours with Rick Kogan - Sunday, April 7, 9 p.m.
Book talk with novelist Jane Hamilton - Volumes Bookcafe, 1474 N. Milwaukee Ave., Chicago - Tuesday, April 9, 7 p.m.
Book talk dinner with novelist Jane Hamilton - InkLink Books, 2894 E. Main St., East Troy, WI - Wednesday, April 10, 6 p.m.
00:39 - At his first book talk for Goats And Sheep: A Portrait Farm, Kevin Horan was explaining his process of making the portraits in order to recruit animals owners to collaborate with him on the project. Video clip generously provided by Rich Frishman from the event at Ott & Murphy Wines in Langley, WA. 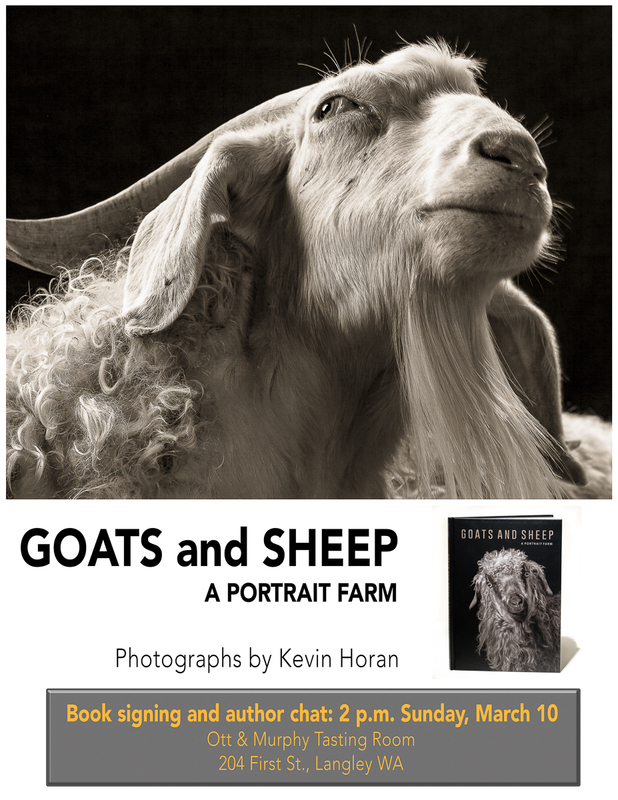 You’re all invited: book launch at Ott & Murphy ~ Sunday, March 10, 2 p.m.
Goats And Sheep: A Portrait Farm, published in Milan by 5 Continents Editions, is now available. The English-language edition, set for U.S. release March 1, can be ordered now from the distributor or preordered from your favorite bookseller. The Italian and French editions can be ordered directly from the publisher. I had the pleasure to collaborate with Whidbey Island artist Claudia Pettis. She's a terrific painter of favorite subject of mine: sheep. And, as a serious breeder of Black Welsh Mountain Sheep, she has access to her own. She generously worked with me for three days to create some new images--for me, and for herself. Alice is featured with Chris Offutt's "food" column in the Fall 2017 issue of Oxford American. Street Census book as a pdf. New Moon Farm Goat Rescue & Sanctuary hosted Goatalympics in July, and we met a lot of good subjects there. We followed up with another shoot at the farm. Abigail was generous with her facial expressions. See more at CHATTEL - 2017. Following a worthwhile session at Review Santa Fe with Jonathan Blaustein, it was a delight to be included in his The Best Work I Saw At Review Santa Fe post. This was a welcome airing out of the Life Everlasting project. A new gallery opens with Chattel as the first show. All are welcome at the opening reception, Sep. 8, 2016, 6-8 p.m. I was able to meet and photograph some new goats at the Island County Fair this summer. Seven new works have just been added to the Chattel collection. Camerawork Gallery in Portland features Chattel Aug. 27 through Sep. 30, 2016. Enter outdoor plaza and then Peterson Hall. The "Critters" show at PDNB Gallery in Dallas will run through August 27, 2016. A crow and her partner completely dispatch a rabbit in a day and a half. This is the ferry from Friday Harbor as seen from Fisherman's Bay on Lopez Island. It's dusk, and that's the glow of Vancouver to the north. I used the long exposure to extend the idea of transport through a mystical space. 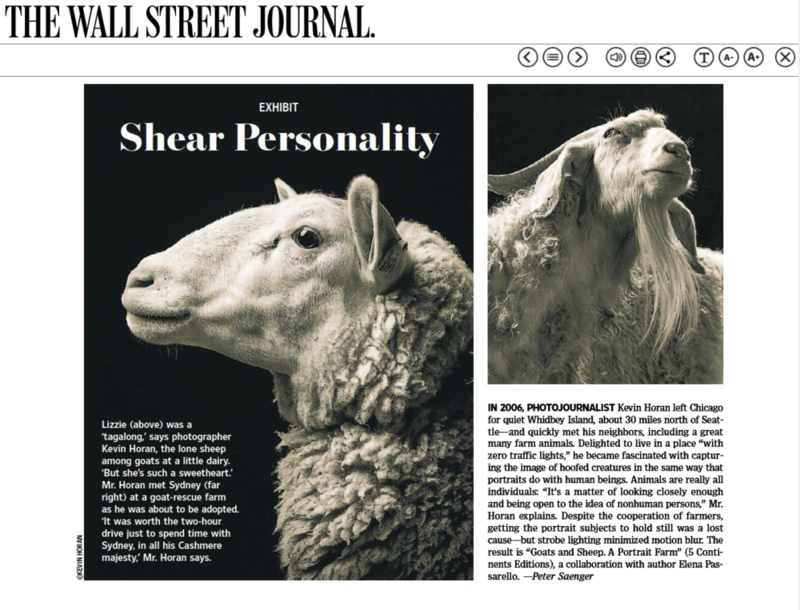 The online magazine acurator.com is featuring the goats and sheep starting Sep. 14. They are in very good company with some terrific photo projects, curated by the amazing and energetic Julie Grahame. The images look best in her full-screen presentation. 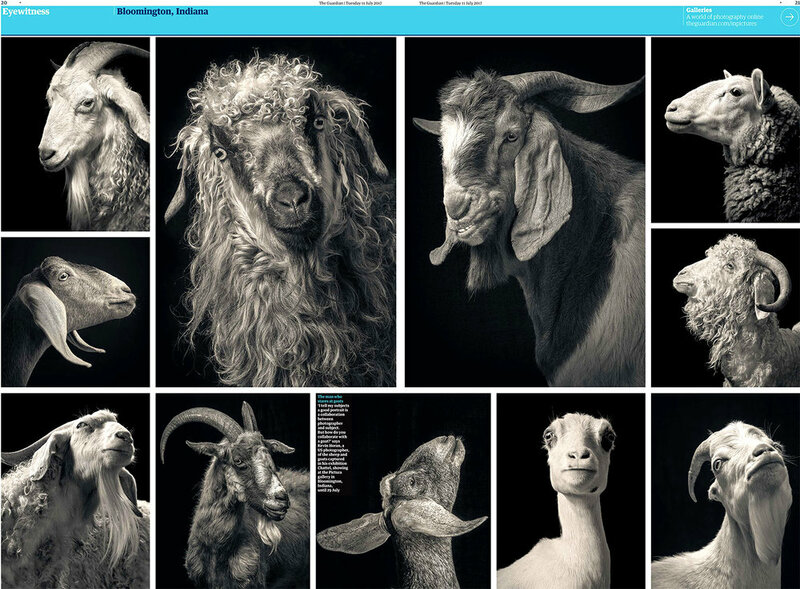 A recent visit to New Moon Farm Goat Rescue and Sanctuary yielded a few new portraits. Stanwood, Mandy and our old friend Jake are featured at the top of the Chattel page.